A friend's daughter is with the San Francisco Girls' Chorus that sung at the inauguration. 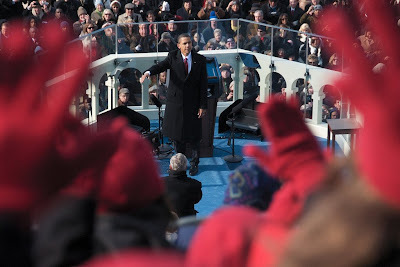 Here's a photo one of the chaperoning moms took from her seat of BHO (we can't really abbreviate him BO, can we?). Thanks to Allison's mom for forwarding the pix. So great! I love all the red-gloved hands.